Alia Bhatt And Vicky Kaushal In A New Pic From Raazi. Seen Yet? Alia Bhatt elated her fans and shared her new look from her upcoming film Raazi. In the photo, Alia looks absolutely gorgeous in a white sari while Alia's co-star Vicky Kaushal is dressed in formals. The photo is definitely a delight to watch, in which Alia and Vicky exchange smiles and look perfect together. Alia shared the picture on Instagram and wrote: "Ummmm just about a 100 days to go. No biggie." In just few minutes, Alia's photo has received over 203, 038 'likes' and fans have highlighted that Alia looks 'gorgeous' in the traditional outfit and we don't disagree. Users have posted compliments such as "so cute" and "perfect picture" while others also expressed that they can't wait for Raazi. Here's what Alia Bhatt shared on Instagram. In October, Alia Bhatt wrapped Raazi's shooting, which is directed by Meghna Gulzar. On the last day of her shoot, Alia posted a picture with Meghna with an emotional note. She wrote, "And we wrapped Raazi last night. Last days are always very emotional because you live with the character for so many months and then you have to let it go. This is pretty much how our life looked like on set - My director and I just totally lost in our own little world hope you guys love the film as much as we loved making it." 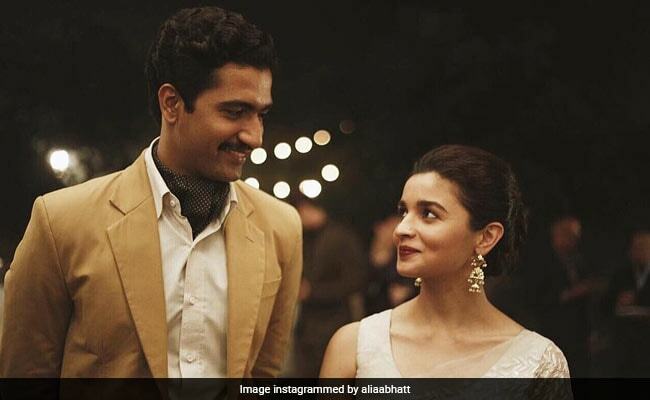 In Raazi, Alia features as a Kashmiri woman married to a Pakistani army officer, played by Vicky Kaushal. The film went on floors in July in Punjab and the second schedule was shot in Kashmir. In November last year, Alia Bhatt unveiled the first look of Raazi. Alia also shared a couple of post-card worthy pictures from Kashmir. Her best friend Akanksha Ranjan Kapoor also accompanied her. Raazi is Alia Bhatt and Vicky Kaushal's first film together. Of co-starring with Alia, Vicky earlier told news agency IANS, "Getting a chance to work with Alia Bhatt, inarguably one the finest actresses in our industry at the moment, is a big deal for me. I am really very excited to be a part of the film. She has worked wonderfully in her movies and brings something new with each film. She sets a new benchmark with her releases. I am sure I'll learn a lot from her and working with her will be fun." Raazi, based on Harinder Sikka's novel Calling Sehmat, will release in May. It is being produced by Karan Johar.